A sump is a hole dug in the ground and filled with stones that makes it easier for the water to infiltrate the ground. It is used to get rid of grey water (water from such domestic activities as cooking, washing dishes and clothes, basins and showers) or rainwater when there are no ditches, channels or networks into which it can flow. It must not be used for wastewater (grey water + black water from latrines or lavatories) for this could contaminate the water table directly. 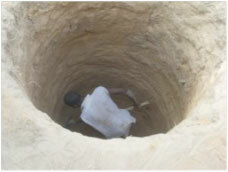 Filling a sump with pebbles in Mali. Sumps have been found everywhere in the world for a long time, mainly to evacuate rainwater. Firstly because it is a very simple and inexpensive way of evacuating the grey water. 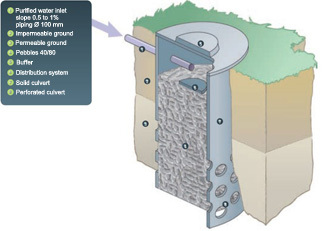 However, in rainy regions that are not connected to a sewer system, sumps are also often used to evacuate the rainwater recovered from the roof into the ground to prevent the land becoming waterlogged around a construction every time it rains. A sump can also be placed at the outlet from a treatment plant when it rejects sufficiently clean water or to supplement a simple autonomous sanitation device like a septic tank. Lastly, the sump can be the ideal solution when trying to avoid releasing water likely to stagnate in Nature and thus encourage the proliferation of mosquitoes. The sump is a hole which carries the water as far as a layer of the ground where it can infiltrate more easily than on the surface. A concrete cylinder, called a culvert and normally about 1 m in diameter, is buried. The culvert is leaktight throughout the impermeable layer of the ground (at least 50 cm). Beyond that, it has large holes which distributes the water into the permeable ground. The culvert is filled with pebbles 40 to 80 mm in diameter. The pipe that takes the water into the sump tips it into the middle of the sump onto a plate so that it is distributed uniformly. All this helps to prevent the water from running along the wall and only exiting through one hole in the culvert, which would saturate the ground on the spot without allowing the water to infiltrate properly. In this way, the sand and waste build up at the bottom of the settling tank and do not interfere with the sump operation. The settling sump must be cleaned regularly. 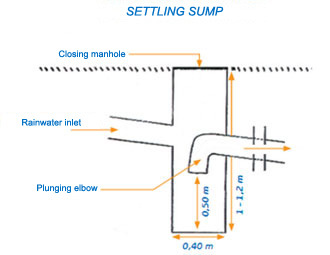 - The sump must be at least 30 m from any well and at least its depth from any building. - The ground must be sufficiently permeable at shallow depth. - It must not be dug if the water table is close to ground level. - The sump must be far enough from any tree or plant so that the roots cannot reach it. - Do not install a sump in places liable to flooding that could make it overflow and make it unusable. - To make it more efficient, it is recommended to install upstream a sink and a small grill for the domestic water, even a small degreasing tank (see Sheet A19 "Settling tanks and degreasing tanks") to stop it clogging. - It stops the ground becoming saturated with surface water. - It also prevents the formation of stagnant water that encourages the proliferation of mosquitoes. - In certain cases, this method can be simpler and less costly that sending the water into a ditch or a sewer network. - Easy to construct and local maintenance. (which must be low) and the ground are contaminated directly. - The sump is not able to purify. It has little treatment efficiency, therefore. - Investment cost : although it is quite high in countries like France where the price range is in the order of €250 to €600 given the costs of materials and labour, it is normally barely €50 or even less in the southern countries. 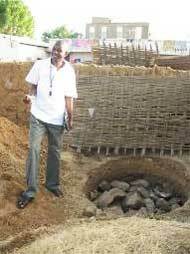 In Mali, in 2004, the Kayes municipal authorities had started a huge sump building programme with the assistance of the municipality of Evry (France) and the French Embassy, in order to combat the extensive public unhygienic conditions in the town. This had the peculiarity of being developed, executed and monitored jointly by the town’s technical departments, the district resident communities, the sponsors and the local operators. Its goal was to convince everyone and to include all the dwellings or concessions in a same street. Without question, this took a great deal of time, so that only 355 sumps out of the planned 627 were built in this first phase, but all these institutions learned to get to know and work together so that they can now launch new execution phases or larger development projects in the municipality under good conditions. A very similar technique, the infiltration bed, also sometimes called infiltration trench, can treat larger quantities of water and above all distribute them better. 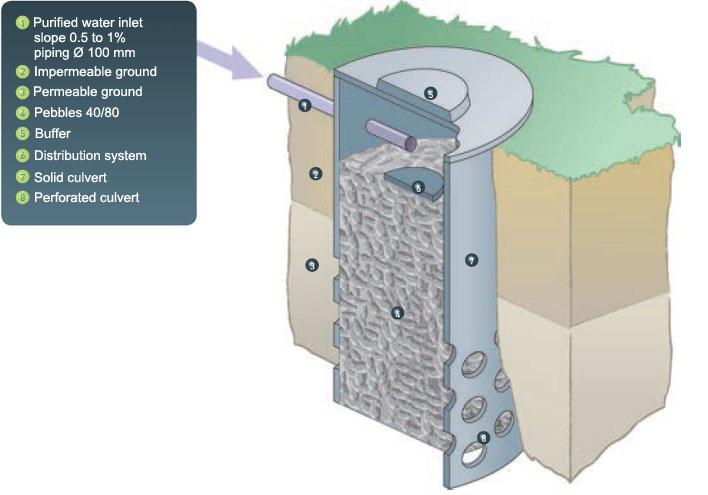 The effluent arrives in a circular or rectangular distribution chamber where it is wise to let it settle before moving it on, usually in jerks several times a day in a star- or rake-shaped network, where perforated pipes are laid in trenches filled with gravel and covered with a geotextile fabric to prevent pipes from clogging. - SATANC, Non-collective sanitation assistance service. - ADOPTA, Douai association for the promotion of alternative rainwater techniques.